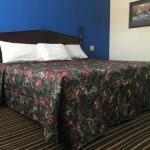 Budget Inn is a 1-star property situated in Magee. Free WiFi is available and on-site parking is provided. All rooms in the motel are fitted with a TV. Jackson-Evers Airport is 59 km away.